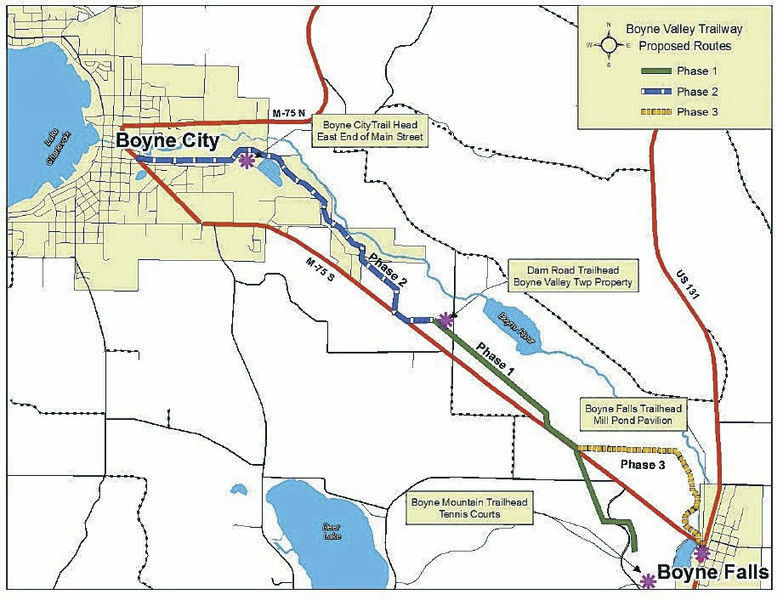 Phase 1 begins at the intersection of W. Michigan Avenue and Boyne City Road in Boyne City and runs along the Lake Charlevoix side of Boyne City Road, through Young State Park via an easement, to N. Springwater Beach Road at the Evangeline/Bay Township line for a distance of 3.2 miles. 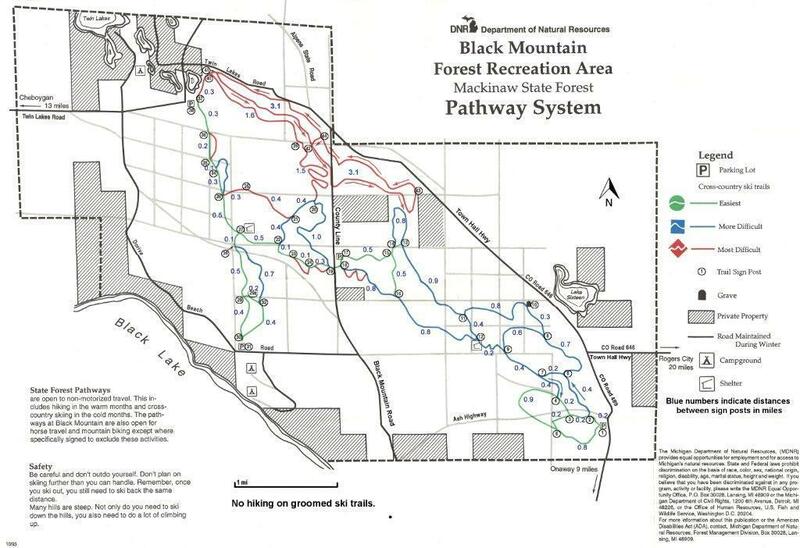 This phase of the Trail is open for use. A dedication/ribbon-cutting ceremony for Phase 1 of the Trail was held on September 1, 2016 at Young State Park. Approximately 60 people attended the event, including area residents, trail donors, Charlevoix County officials, the County Road Commission, the City of Boyne City, Evangeline Township, State Representative Triston Cole, a representative from U.S. Representative Dan Benishek’s office, officials from the Michigan Department of Natural Resources, Northwest Design Group (project Engineers), Team Elmer’s (Contractor), and the media. Phase 2 begins at the Little Traverse Wheelway in Hayes Township, east of Waller Road, crosses US-31 and follows a series of easements across private property to Boyne City Road east of the Argonne Supper Club, and then runs parallel to, but separate from Boyne City Road within the road right-of-way on the north (Susan Lake) side of the road to Quarterline Road, southeast of Susan Lake, for a distance of 2.97 miles. At the point where the trail meets Boyne City Road east of the Argonne Supper Club, a trail spur runs west within the right-of-way on the north side of the road to Eastern Avenue to create an access point for Pine Point Subdivision. Trail users can follow Eastern Avenue to Lake Charlevoix where there is a public access with a picnic area and swimming beach. Phase 2 was constructed in 2017. 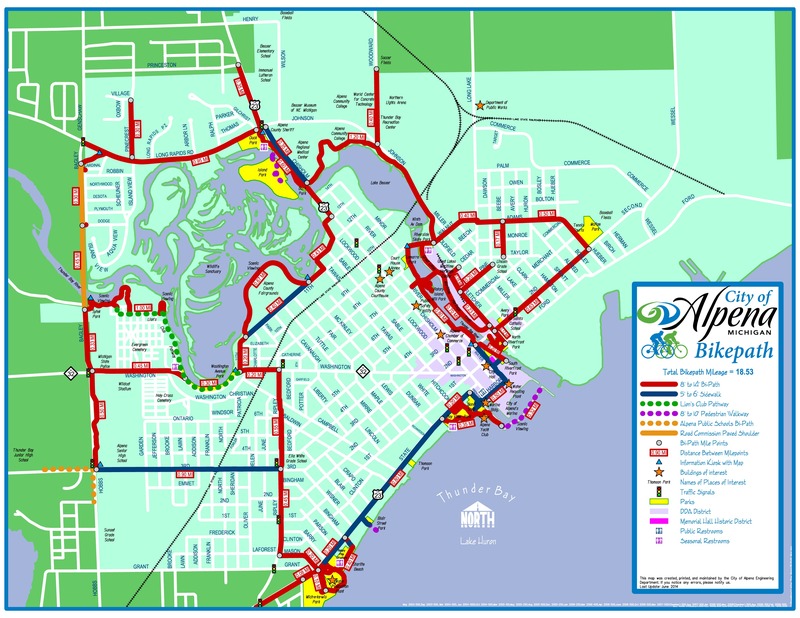 Phase 3 will begin at the completed Phase 1 of the trail at N. Springwater Beach Road (the Evangeline/Bay Township line) and continue detached within the right-of-way on the Lake Charlevoix side of Boyne City Road through Bay Township. Just east of the Village of Horton Bay, the trail will connect to the (paved) wide shoulder of the road through the Village (vehicle speed limit: 35 mph). The trail will utilize the shoulder of the road due to the close proximity of homes to the road. In Horton Bay, trail users can take Lake Street to a public access beach on Lake Charlevoix where there are benches to relax and enjoy the view. The famous Horton Bay General Store and Red Fox Inn are also located along the trail route. 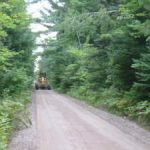 On the west side of Horton Bay, the trail will pass Horton Creek and the Rufus Teesdale Nature Preserve before becoming detached once again on the Lake Charlevoix side of the road, and will continue on to Pincherry Road for a distance of 2.9 miles. 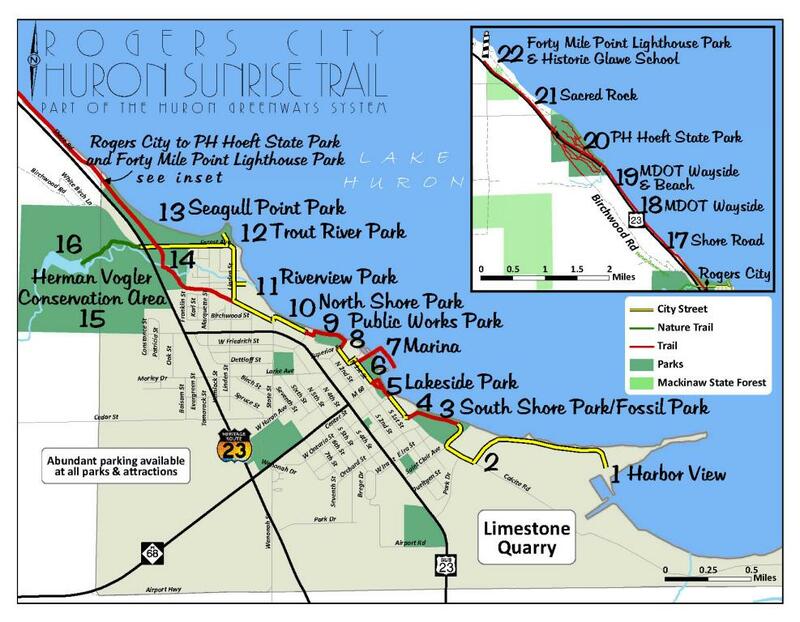 Trail users will be able to follow a bike route (posted with signs) along Pincherry Road to US-31 at Bay Shore, where it will connect to the Little Traverse Wheelway. Phase 5 will begin at the completed Phase 4 of the trail at Hayes Township Park (formerly Camp Sea-Gull) and continue as a detached trail within the right-of-way along Boyne City Road on the south (Lake Charlevoix) side of the road to Pincherry Road in Bay Township, where it will connect to the end of Phase 3. This phase will cover a distance of 2.7 miles.